Yup, sure is, I said. I was eating a late lunch on my daughter’s patio– quinoa salad with crackers and an Island Hoppin IPA– working up an appetite for a tour of the local rum distillery. Earlier in the morning I’d gone casting for tarpon near the Frederiksted Pier and then went snorkeling for the first time ever. I had made an impression with the fly rod even though the big fish probably had a laugh or two. They don’t see a lot of fly fishermen down here. I doubt if there’s a fly shop anywhere on the island, or even a crappy selection of artificials at the local Kmart, which is just another reason to believe in the beauty of this place. I had a dozen tarpon flies that I’d brought along with me, and they would have to do. When I snagged one on the deep edge of the shore, one of the spear fishers swam over to release it. I’d have tipped the kid for his service if I’d had any money, but the guys were having too much fun and, really, the whole scene transcended such pedestrian affairs. At first I felt like a duck walking backwards, but then I grew some fins and tossed away the flippers. Next thing I knew, there were fish. What’s that, an angelfish? Parrotfish! Blue fish darting over brain coral as if they were thoughts released by an intelligent sea. We toured the Cruzan Rum Distillery (“the World’s #1 Rum”) which is close enough to my daughter’s place that we could sometimes smell molasses wafting through the night from a mile away. The tour included two big drinks, our choices from a field of rum dum recipes, that went down coolly in a sweltering hour. I went night fishing for tarpon but the big fish were deep and only occasionally nodded toward the passing fly. Once in a while the waters near the pier exploded with a flurry of tiny fishes trying frantically to escape a cruising predator. I would cast ahead of a giant form that swam along the shore, but the fly could not compete with the multitudes of possible prey. We took a midday drive along a rough road north of Frederiksted and stopped at an abandoned military compound. We climbed into the forest, one of the wildest areas of the island, and reached an old rusted lighthouse overlooking the deep blue waters. The precipitous bluff where the decaying lighthouse mutely stands was once the refuge of maroons, or slaves who escaped from their Danish masters and were able to find temporary safety in caves. Some were chased by dogs and chose to leap to their death in the sea rather than return to a life without dignity or freedom. We were on the wild edges of a remnant rainforest now inhabited by wild goats and the common mongoose. Alyssa was delighted to find a geocache just off the trail near the lighthouse. We added a brightly colored stone to the collection, one that I had found in a man-made labyrinth of an old sugar cane plantation in the rainforest ambience of Mt. Washington. In the evening Alyssa drove us to Salt River Bay on the northside. We were scheduled to take a kayak tour of Bioluminescent Bay, the Cape of Arrows, where Christopher Columbus had been met by a band of less than welcoming Carib Indians. As the sun set on the sea beyond, our tour guide, full of excellent information, jokes, and questions for us, set the scene. Four kayaks with eight people pushed off into a rare and fragile ecosystem where plants and animals and “walking” mangrove trees supported high concentrations of bioluminescent dinoflagellates existing in the shallow bay. We were told that oceanic plankton, the dinoflagellates, are able to generate a chemical producing luminescence, an emerald green and ultramarine illumination when their waters were disturbed by our movements. It was hard to imagine until darkness enveloped our paddling motions on the quiet waters. As the lights from houses and mansions on the steep hillsides of the bay began to shine, our fingertips and paddles began to drip as if with tiny stars. Other kayakers joined us, and bodies glowed electric. The phenomenon eluded the power of words, and even our cameras couldn’t capture the beauty. Leighanne took a quick swim off the bow of our vessel, and she could’ve become a glowing mermaid for all I know. Small explosions of quiet luminescence happened with every move. We could sift small blobs of innocuous comb jellyfish from the water and watch them morph into something like a lit up light bulb. Our guide turned on a flashlight and fish leapt from the water, skipping and flying toward the mangroves. One of them crashed into Alyssa’s kayak like a shot. There are less than half a dozen luminescent bays in the entire Caribbean. We need to care for their preservation because… they’re just not being made anymore. This entry was posted in Uncategorized and tagged adventure, birding, Caribbean Islands, Caribbean Scrambles Part 2, fishing, hiking, nature, photography, snorkeling, St. Croix, swimming, travel, U.S. Virgin Islands. Bookmark the permalink. Looks absolutely amazing, seems you had great time. Happy to see the local pigeon too. Did the bioluminescent bays live up to the expectations? It was fun, Salla, and I’m glad you appreciate one of the local pigeons, which is actually one of several pigeons/doves from the visit that are “life birds” for me. The bioluminescent bay far exceeded my expectations because I didn’t really know what to expect before the visit. It was spectacular. Thank you, I’m glad you liked! True stories from the road… sounds great! Loved your description of the bioluminescent waters, and what a wonderful experience. Mermaids? Now, that’s really something, or rum coral brain trickery. Who knows? Great stuff, thoroughly enjoying your island tales. Thanks much, Mr. Plaid! I’d never tried snorkeling either, and was a little reluctant to try because I’m only a so-so swimmer, and floating around in 30 feet of water that really doesn’t care if you live or die put me on edge at first. But once you get the hang of it, the underwater world comes to you. And the sights can be inspiring, to say the least. There’ll be more on this in the next installment when I report on our visit to an underwater national park/monument at Buck Island. As for mermaids, well that’s rum brain trickery, I guess, but my wife swimming in a bioluminescent bay could bring me to believe. Sounds like you’re having a great time, exploring the sights & fauna. 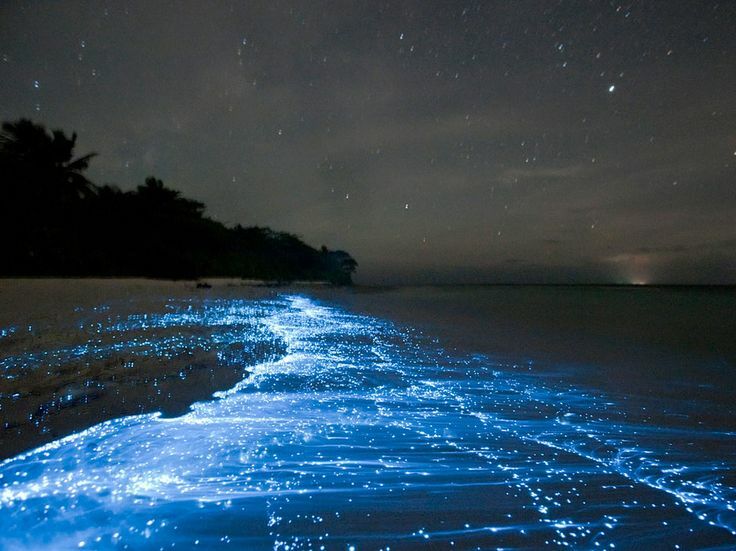 The picture of the bioluminescent is incredible, it must be amazing in person. It was a fascinating jaunt, Ross, and I’m still sorting it out in my head. Those lights still keep blinking on and off! Thank you and, by the way, congrats on the recent graduation! Even though the photographs are gorgeous, I imagine that you’d really have to see things in person to really grasp the beauty. The last photo is magical Walt. Photographs can carry more weight than words, Howard, but in this case they also just fall short and merely suggest… We do what we can with what’s available. Anyway, thanks, as always, for being here. I am loving the adventure! It’s fun to go on a trip with such a student of the life around us as well as the history that human life haso left behind. And those lights, man! I mean, what?! Keep it coming. Well done fishing with those feathers. That’s part of the fun, Mike, being able to share the fruit that’s grown on these occasions, whether it be fishing with feathers (mon) or reporting on an interesting critter or telling the tale of what went on before we ever came to the place. If we’re living with our senses open then we’re all students of the life, and it’s great to be sharing a seat with you here! Thank you. Wow, Walter, my head would be spinning from sensory overload! Great photos! Maybe Bob; I know that mine was, even when sober. Overload is good at times, as long as we can pull out in the nick of time. Thanks, friend. Sometimes you get an experience that transcends everything you thought you knew–this looks like such an experience! There’s certainly beauty everywhere in the world, and it can be present in anything from a rusting piece of history to an aquatic Northern Lights. Great posts. Brent, Yes, absolutely right about that. Everything has a story if we know where to listen for it. Thanks! The snorkeling had a stimulating aspect in that it opened up first-hand access to an underwater realm that I was new to. Indeed, the waters were shades of blue and very clear where we entered them. More on this to come, but thank you, Bill, for reading and commenting. It would open up a new dimension in the night-fishing game, wouldn’t it? With glo-bug dries? Thanks Les. Wow! That last photo is amazing. Sorry if I’m late in responding to these. I’m not well. I’ve spent the last week-2 going back and forth to the Neurologist, Bunch of CT scans and other medical issues. Glad you’re doing well. Thanks Doug, but sorry to hear that things aren’t going well right now. Will hope for better days soon. Write me if there’s any way to help!